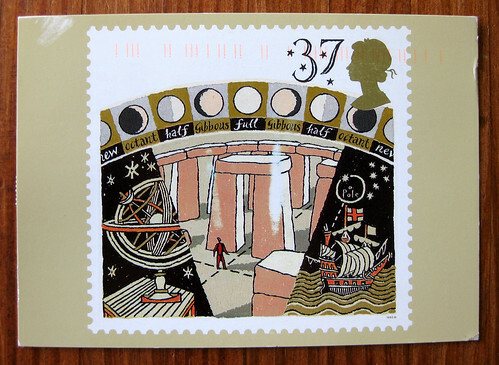 This lovely UK postcard, showing the Stonehenge stamp with the phases of the moon, came to me from Sheila at A Postcard a Day. She didn't know this, but I love both the moon and Stonehenge (though I've never visited either, ha). I like the globe and ship motif, though I admit I'm not entirely sure what it represents. On the back she included these fine UK stamps, including my favorite, the London Post c.1839. 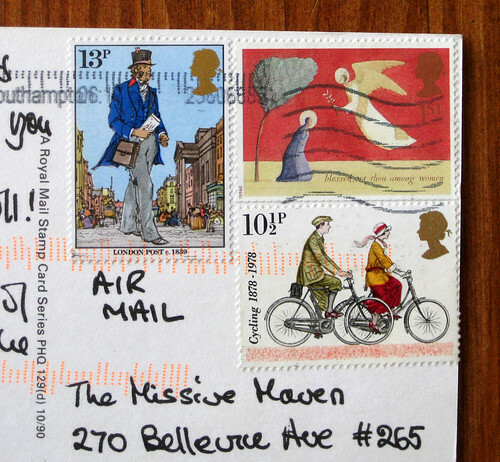 I love those stamps now do all those stamps from the UK have the shadowy queen image in the corner ? I have quite a few of those myself and was just wondering . Thanks for the great post .